Metus QuickCut is a new lightweight clip editor, which plays, trims and assembles clips, and exports files without rendering. It enables editors and non-editors to make cuts on the fly, with the aim of reducing programme turn-around times. The Windows-based software can operate on even modestly specified laptops and desktop PCs, yet has the power to support professional formats including MXF, XDCAM, MPEG-2, MP4, the company claims. “Most standard NLE packages have become so feature-packed that they’re no longer the best option for fast cutting and simple clip assembly. QuickCut is all about speed editing: it’s fast to load, easy to learn and can run alongside other software without issue,” said Mustafa Yilmaz, managing director of Metus. Edits exported from QuickCut can be used instantly live on air or incorporated into larger projects using users’ existing NLE. 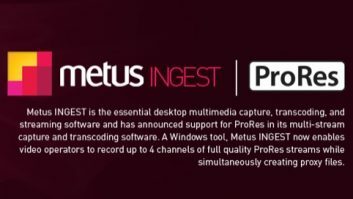 At launch, Quickcut is bundled with Ingest Professional, Metus’ multi-channel ingest, streaming and transcoding solution. A standalone license will launch at a future date.